CRM Product Creation allows users to create products that do not already exist within the accounting system. This is particularly useful if you have a large catalogue of products and they're not all setup within your accounting system. In addition, if you sell customisable products then this would also be useful to your business. Firstly, you will need to enable the Product Creation option in the Settings. To enable your Product Creation, click on the Settings icon in the bottom left-hand corner. 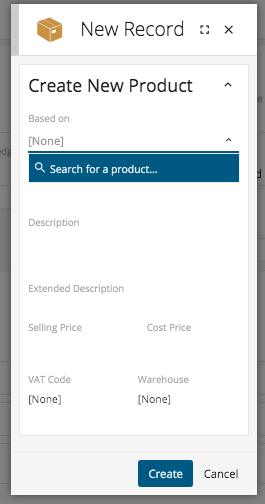 Once within the Settings Centre, navigate to the Products & Stock section and scroll down until you reach the 'Enable product creation' configure option. Simply click 'Enable' to make this functionality available. Now we have turned on this system option, we can start to create products when quoting customers. In the below screenshot we have a Quote record. By clicking on the arrow head next to the Add Existing Products button, you can select the 'Create New Product' option. You will firstly be asked to choose a product to base your new product record on. 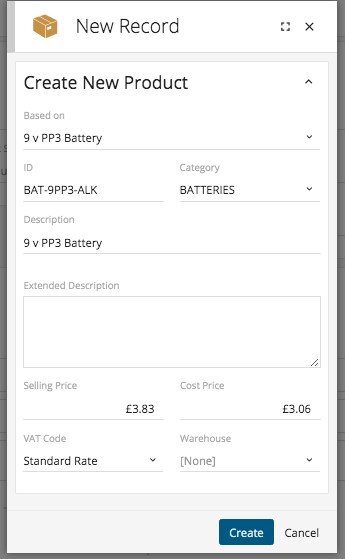 For example, I may wish to add another type of Battery product, so I search by 'Battery' and select a similar product type by clicking the 'Select' button. The information from this product will then be pulled through, which can be edited to suit your new product, such as Selling Price & Cost Price. Please note: the Product ID must be unique. Once happy with the information entered click 'Create' and the product will be added to your Quote record. When the order is confirmed, the product will be created in your accounting system.